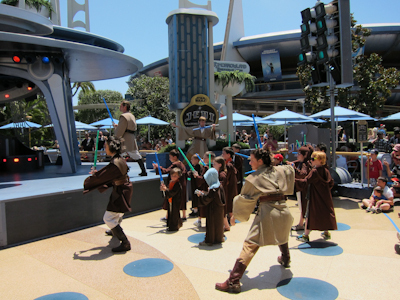 Be sure to read Part 1: Selection and Training, before proceeding with this post, particularly if you’re looking for tips on how to get chosen for the Jedi Training Academy. Let’s just dive right in, shall we? Everyone turn on their John Williams albums… (no, seriously, if you’re a Star Wars and/or John Williams fan, you need to watch that video) and settle in. The Dark Side awaits. 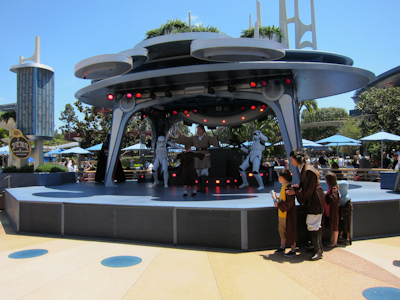 We last left our well-trained Padawans gathering by the side of the stage as the Imperial March echoed through the terrace. 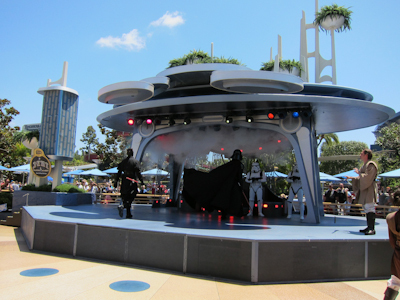 Then much to everyone’s surprise (not really), the stage, in a slow-motion smoke-filled dramatic manner, rises and our intrepid enemy appears. 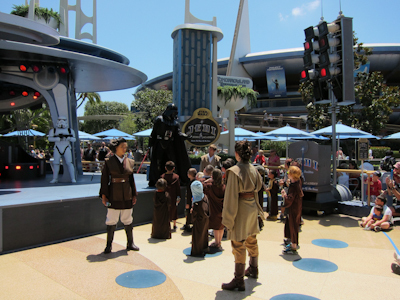 The main Jedi Master kind of stands there and tries to have a reasonable conversation with Vader, who must be really hot–but wait, actually the real Darth Vader’s cut little outfit breathed for him so I’m assuming that was air conditioned–surely Disneyland’s version is as well. 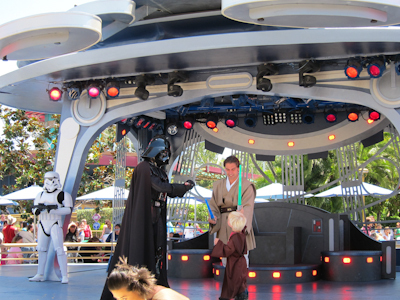 Vader blows off the Jedi Master to have a little chitchat with our newly-minted trainees. 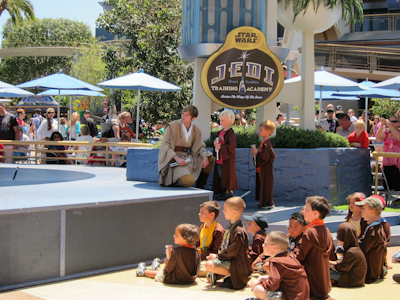 Whatever, Jedi Master dude, I'm talking to these kids myself. Now I’m actually going to backtrack a second and insert an earlier picture because I want to talk about something I actually only noticed this time. You can see here that the kids have already been roughly separated into two lines, one across the front of the stage and one up the stairs. Darth Maul will come out in a second (god Shelby, talk about ruining the surprise!) and when the fighting starts, half the group will go on stage to fight Vader and the other half will stay on the ground and fight Maul. 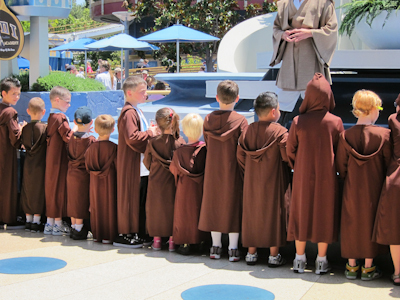 They're like little brown-robed sheep! 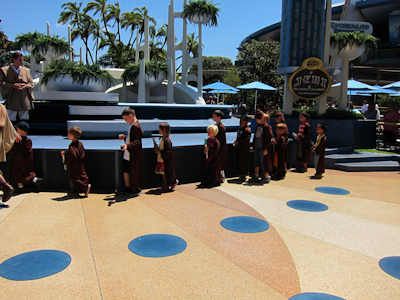 This is where the Jedi Masters are separating the kids into lines. Prior to this viewing I had thought it was roughly random, but it’s actually really not. 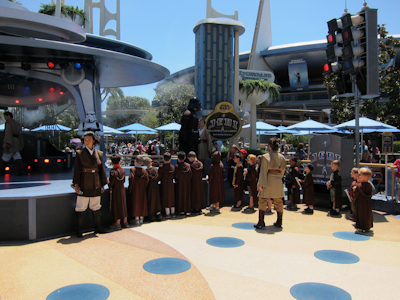 All of the bigger kids are lined up to fight Maul, while the little ones go on stage with Vader (I keep wanting to call him Darth, but they’re both Darths. That must get awkward at cocktail parties). 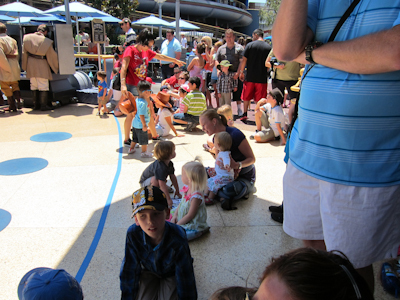 Additionally, the less confident kids and the smallest kids are placed at the ends of the lines. 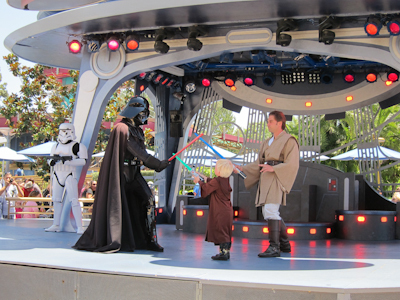 Since Anderson was having some trouble with his light saber earlier, he missed some of the training practice. They placed him second-to-last in the Vader line. I thought this was a brilliant move, because it gave him a chance to see the “fight” several times before it was his turn, and I think it really helped him. 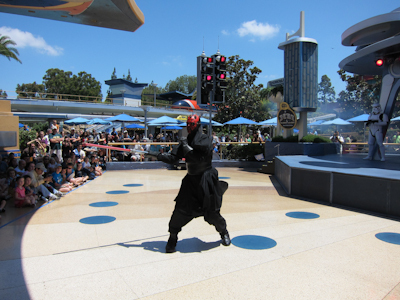 And as far as Vader vs. Maul, I have to say that Darth Maul is actually really scary. And I’m saying that as an adult. He is very intimidating and his mask is just effin’ terrifying. He is very menacing on the floor. And while Vader is scary too, to a little kid, he’s more iconic, easily recognized, less like a human, and just less frightening all the way around. 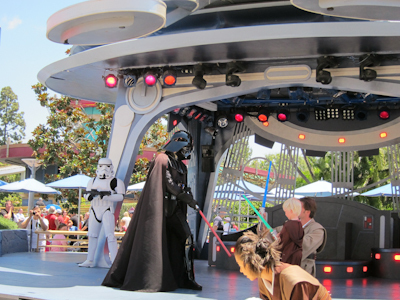 I’m positive that’s why they send the older and bigger kids up against Maul and the little ones to Vader. Late to the party, as usual. What? You had trouble finding a sitter too? Riiiiiiiiight. 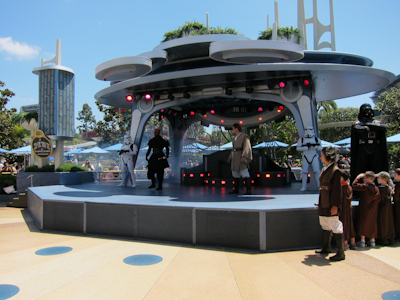 Maul jumps off the stage and terrorizes the audience a bit. I'll get you, my pretty--and your little dog, too! Also, Maul’s light saber is double-ended, which makes him simultaneously really scary and completely badass. 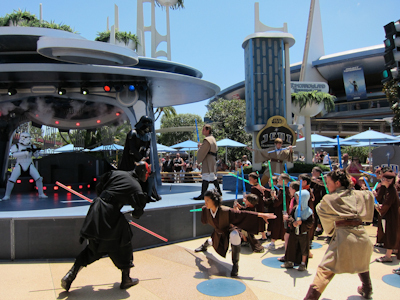 As I said, the kids go up individually to battle their respective Darth. And also as I said, because repeating myself is awesome, Anderson was at the end of his line. The kids sitting down have already finished their battle. By the time it was Anderson’s turn, he looked a LOT more confident. Here he gets his final pre-battle briefing. 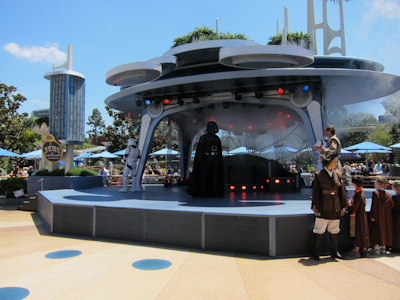 Anderson doesn’t even waver as he bravely faces off Vader. OMG, he's so little and cute!!! He actually let go of the light saber with one hand and was going at Vader tennis racket-style, so the Jedi Master paused to remind him to use both hands. Rather than taking the opportunity to chop off his hand, Vader obligingly waited until Anderson was in battle shape again. Both hands, now. Hate to lose one. Bad form. OMG LADY GET OUT OF MY PICTURE!!!!! And the final move–head shot! And as you have likely noticed, the Jedi Master was right there with his light saber deployed to block any errant saber swoops from either side. I’ll back you up another time too to point out a fun effect they did. About halfway through, they selected one of the kids–one of the particularly confident-looking ones–to use the Force against the Storm Troopers. They had him hold out his hand and a Storm Trooper stumbled backwards like he’d been hit. Then they did the other one, and then they did both. 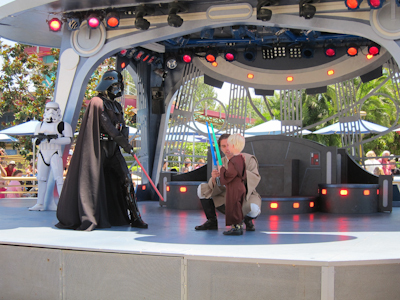 After all of the hand-to-hand combat was done, the Padawans gathered at the side of the stage and Vader came over to try one last convincing argument to turn them to the Dark Side. "Come to the Dark Side--we have cookies!" No way, no how, Señor Vader. Just don't swing those around, okay? And then Maul comes over to try to convince them too, but he can’t speak and let’s be honest, he just doesn’t have the persuasive kind of personality that Vader does. 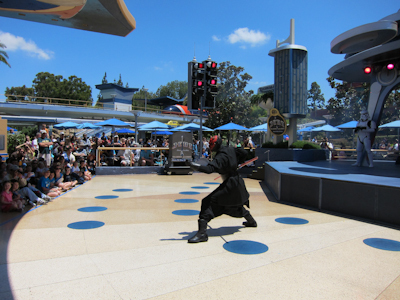 Darth Maul isn't what you might call a "people-pleaser"
Completely rebuffed, they march back to their moving platform on stage with Vader doing his dramatic cape-swooping thing that’s like the ultimate walking off in a huff maneuver. 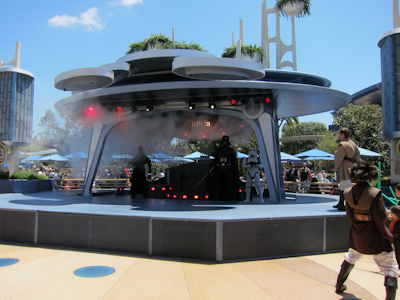 The Imperial March fires up again as Vader and Maul descend into the abyss, probably to get a much-needed drink of ice water. "I'll be back." Oh wait, wrong movie. 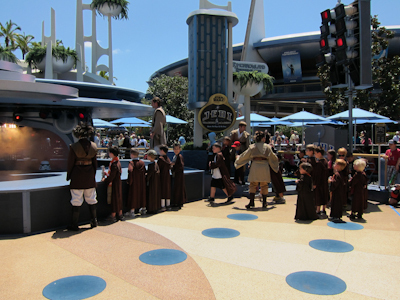 Our victorious Padawans are lined up against the stage again. I mean, it’s no Rebel Alliance celebration like Luke Skywalker got, but close. 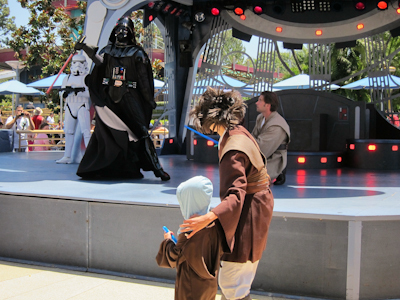 They get one final pep talk about always using the Force for good and don’t join the Dark Side and drink your milk. Then they turn around to face the audience for one final picture. 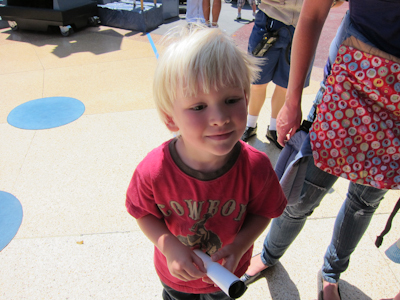 Unfortunately, I think Anderson didn’t hear him when they said to turn, so I didn’t get a picture of his face, but he’s still adorable. "Parents, stay where you are and let your kids come to you. Otherwise we're seriously talking mass chaos"
I was incredibly proud of both Theo and Annika (known troublemakers, the pair of them), who stayed seated and watched the entire show! 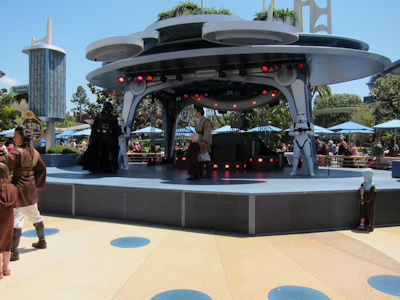 Who faught Darth Vader? Oh yeah, that was me. 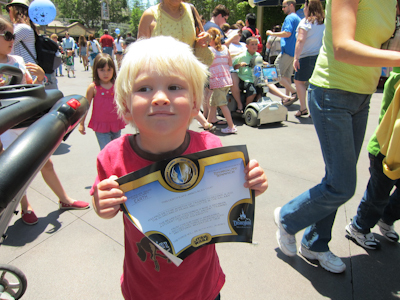 It wasn’t until after we rode Small World that I remembered to take a picture of Anderson and his actual diploma. 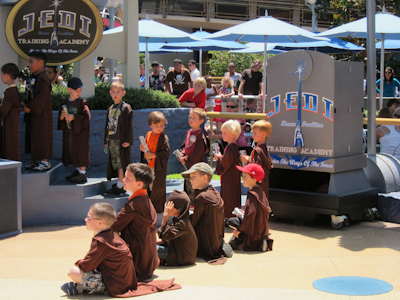 And that, ladies and gentlemen, is the Jedi Training Academy. 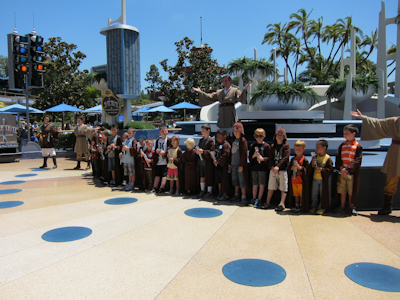 I am totally jealous of all of the little kids. Which is sad. 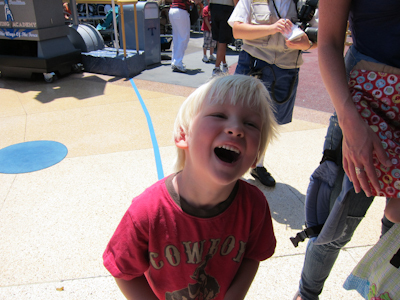 If my now grown son knew he had missed out on the Jedi Training Academy I think he would stop speaking to me. Good job, Shelby! I know, I truly regret having been born in the wrong decade, er, century, er, millenium (now that’s getting depressing) :D.
It is amazing how talented Disney Cast members are to manage so many little children in a complex fight/drama. I loved the detailed analysis of how and why children are picked and sorted the way they are.